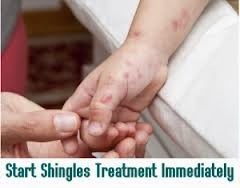 Many ways to treat shingles disease. Here is some tips treatment for them. Using nonprescription pain medicines, such as acetaminophen, aspirin, or ibuprofen, to help reduce pain during an attack of shingles or pain caused by postherpetic neuralgia. If you are already taking a prescription pain medicine, talk to your doctor before using any over-the-counter pain medicine. Some prescription pain medicines have acetaminophen (Tylenol), and getting too much acetaminophen can be harmful. Capsaicin, a natural compound derived from cayenne or chili pepper, can be used topically for pain relief. It is available in ointment form as Zostrix, and can be applied four to five times daily for pain relief. It works by blocking pain signals from nerves just under the skin, and is very effective in reducing the pain of herpes zoster. Lemon balm is only one of the herbs in the mint family that are effective anti-herpes agents and contain at least four antiviral compounds that target herpes. Other members of this botanical family include hyssop, oregano, rosemary, sage, and thyme. Cat’s-claw extract has anti-inflammatory and antiviral actions. Take 1,000 milligrams three times a day. Caution: Do not take this herb if you are pregnant. Reishi mushroom extract stimulates the immune system to fight infections such as herpes. Take 500 milligrams three times a day. The combination of echinacea and goldenseal is antiviral, immune- stimulating, and detoxifying, and is helpful in the treatment of herpes. Take 1/4 teaspoon of tincture in tea or juice three times a day. Or combine equal parts of tinctures of echinacea, goldenseal, nettle, and Siberian ginseng, and take 1/2 teaspoon of this mixture three times a day to strengthen your immune system and make it less vulnerable to infection. Garlic has antiviral properties. Take 2 capsules of garlic extract twice a day for a week. Or just add a few minced garlic cloves to food such as pasta or salad every day for as long as you have shingless. Lemon balm, also known as melissa, contains compounds known as polyphenols that have anti-herpes properties, and is felt by some to be a first- choice herbal treatment. Use topical applications of lemon-balm tea, which you can make by steeping 2 to 4 teaspoons of herb per cup of boiling water. Apply the tea to the blisters with a cotton ball four times a day In Europe, an ointment containing 700 milligrams of dried lemon-balm leaf per gram is widely used. Licorice contains several antiviral and immune-boosting compounds. You can apply a licorice ointment locally, drink a weak licorice tea, and/or apply a strong tea directly to the rash three times a day. Oat-straw extract calms the nervous system. Take 500 milligrams three times a day.